Trust is the biggest obstacle to sales online. Customers only ever buy from businesses and sites they trust. Established marketplaces like eBay and Amazon have grown through their relentless focus on trust. If the item is available on the marketplace they are loyal to, customers will choose to buy there. Any retailer who is not selling on these large marketplaces is almost certainly losing sales to a competitor who is. Having a loyal customer base ready and waiting to buy is a huge advantage to selling on marketplaces. Trust built by a marketplace means loyalty to a marketplace though, and you need customers to be loyal to you as a seller. Trust and loyalty to a marketplace can be leveraged by sellers and even transferred to their own brand. The following points can all help to transfer customer’s marketplace loyalty to your brand. You can’t be loyal to a brand you don’t know, so branding is the first step to creating loyalty. Amazon knows how important loyalty is, and have protected customer’s loyalty to the Amazon brand by keeping their own brand as the focus and giving sellers as little branding in the marketplace as possible. This has always been a major drawback to selling on the Amazon marketplace. Professional Amazon sellers now have a massive advantage able to them, as the marketplace has recently started to allow sellers to have full storefront design for Amazon stores. This design allows you to introduce your brand, merchandise the full range of your stock, and even have multiple pages for different categories and product ranges. Letting customers know that your brand is responsible for the products and services they receive encourages loyalty to your brand and increases the chance of them buying from you again. Even if your orders are fulfilled by Amazon, you can own that great service in the mind of the customer. The same as with Amazon, for eBay shoppers to be loyal to you, they first need to know who you are. When customers land on one of your listings, they should immediately get a sense of your brand. Ebay allows for full customization of listings, and so sellers can create a full store feel within listings. 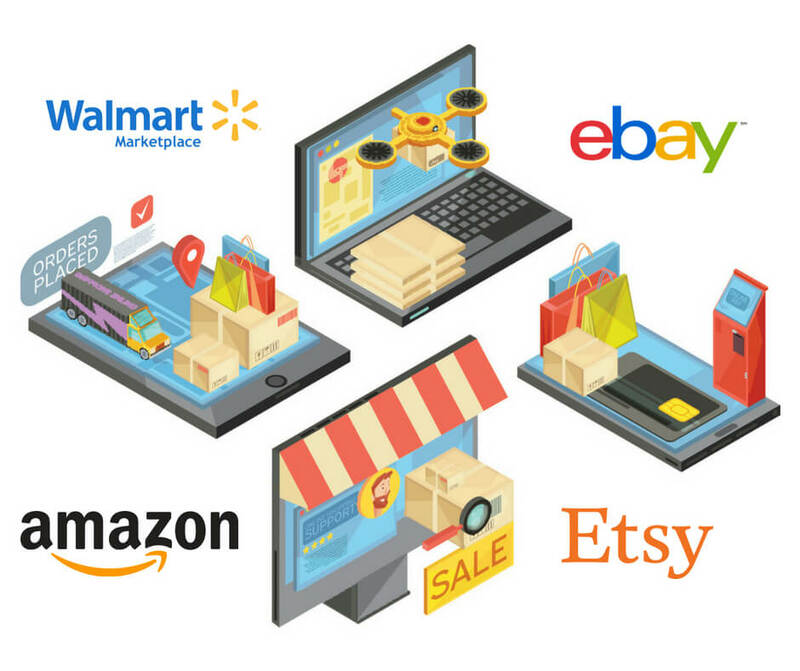 A custom branded eBay listing has the same benefits of a stand-alone brand website, but with the added benefit of the trust customers feel shopping on the eBay platform. Cross promotion is one of the most important features in creating brand loyalty within eBay. By cross-promoting your own items within listings, you encourage customers to continue browsing your inventory, rather than searching and viewing other sellers listings. Keeping customers browsing your listings keeps them focused on your store, and secures your branding in their mind. The more of your listings a customer views, the more likely they are to buy from you. Getting a customer to make their first purchase with you is the hardest part. Once a customer has purchased and they know you offer products and service they like, it is less of a challenge to encourage them to purchase again. Parcel inserts with special offers are great for encouraging repeat customers. Your inserts could offer something for their next purchase from you on eBay, or they could encourage the customer to visit your website and purchase there. A customer who has purchased from you on eBay will be more likely to trust your website. Parcel inserts are also great for encouraging social follows of mailing list sign-ups. 10% off their next purchase is a good incentive to sign up for your mailing list, which would allow you to stay in touch and keep your store in their mind. Don’t just forget about people who buy from you. Ebay is familiar. It’s an option customers immediately think of when looking for an item online. As much as you can, you need to try and make your store familiar too. This means reaching out to old customers. Reaching out to customers does not have to be spammy or annoying. You could put some time aside one day and trial writing a note to a handful of your most frequent customers. A brief, genuine note of thanks for a customer’s business can go a long way to securing their loyalty. A handwritten note will take a little more time, but it is worth the effort for how it will impress customers. Aside from that, you should be sending customers newsletters, incorporating inspiring and exciting images of your products, as well as interesting product information. Nothing beats great customer service for creating loyalty. Above the way a store looks or how beautifully it packages orders, great service will always be the number one thing to keep customers coming back to you. This means offering fast delivery (for free if possible) and being quick and helpful with replies to customer questions; whether they be via phone, email, or social media. E-commerce offers limitless opportunity. The price of this is fierce competition. No matter where you sell, creating customer loyalty requires attractive products, competitive pricing, and excellent service. Ticking all of these boxes is hard work. Any seller who manages it will be delighting customers. Branding is the key to turning this good experience into loyalty. Branding every moment of the sale, from the product page to product unboxing, lets the customer know which company to return to for this great shopping experience.